There are a few things we really like about the Holy Stone HS160 Shadow FPV RC Drone, and it all starts with its design. This isn’t a tiny little mini-drone toy, but the foldable design lets the arms fold into the body of the quadcopter so it’s only about the size of a smartphone when you stow it. 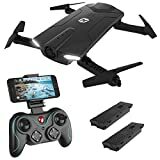 It also has a bunch of cool features like one-touch takeoff and landing capabilities, and it’s on sale right now on Amazon for just $90 with Prime shipping.